This is beautiful. Lovely tribute. This is the cost of greed. More and more, I feel weary of the incessant fashion bloggers who insist of buying and wearing sweatshop fast fashion. Really, now, must we not care about the wellbeing of others so blatantly? Thank you for reminding me that there are those who do care for fashion but not at the expense at the lives, or livelihood of others. 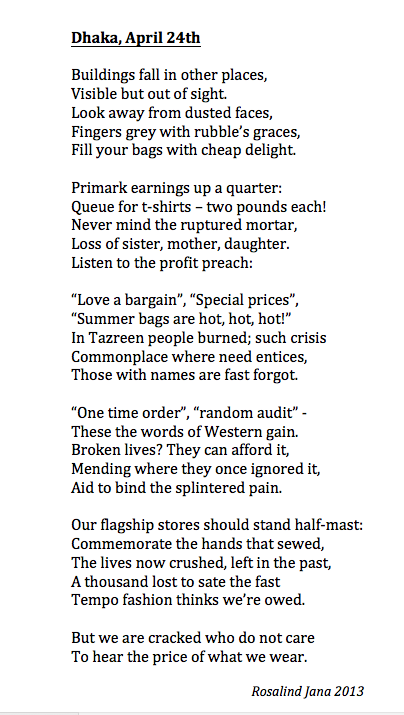 Such a moving piece, it really makes you think about fast fashion and what it really costs. I do try not to shop at most places like that, but sometimes those prices are hard to resist. thank you, thank you. I am re logging this, with attribution. The price of rampant consumerism.The lack of pictures is apt and sad at the same time. This is fantastic. Everyone should read this poem. 'Fast fashion' has too costly a price on its head, and it's so easy to forget the pain at its heart. Well said! Those who turn a blind eye to what they wear and where it all came from should feel the charge of your accusation. Yes. Spread the word, because once we KNOW, we can't pretend we don't know. Ignorance is tragic, but continuing the pattern is evil if we know the truth. I'm grateful to be a part of a community that cares. It's imperative to keep talking about it, whether it's through blogging, articles, or protests. Thank you for this post. Marvellous writeup Roz! So honest and true! Thank you. The world is full of more wonderful people than the other kind, and we always need to remember that-- as Patton Oswalt said so popularly in the U.S. after the Boston Bombings. Full of people like you who care! I know you will help inspire others. You are really talented poet. Such poignant words!